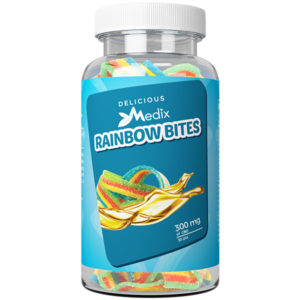 Medix CBD infused Rainbow Bites are a great way to enjoy the potential benefits of dosing CBD. All your favorite fruity flavors all in one place. Their delicious CBD gummies are infused with top quality Phyto-cannabinoid-rich hemp oil. These CBD gummies are American made and carefully prepared for the ultimate CBD experience with every tasty bite.